Wow. A blog title that doesn’t begin with the ‘C****’ word? That feels a little strange to type. Four months ago I crossed into China from Kazakhstan and now I’m finally out the other side. The South-East Asia adventure begins here in Vietnam. I was a little nervous at the border. Officially you have to have proof of onward travel to qualify for a visa-free fortnight but the border guards didn’t care at all. Who wants to buy a chicken? I was no longer the only white guy around. After a months of being super-excited every time I saw a foreigner it felt strange to have suddenly hopped into such a tourist-friendly world. I cycled around the corner to sit down and gather my thoughts where I could look back across the river to China. There was a gaggle of middle-aged Australian tourists gathered by the fence taking photos of China. ‘It’s crazy to be so close to China, isn’t it?’ ‘Hey look, there’s that Mao bloke on the big TV over there!’. I was in another world, there was no mistaking that. You wouldn’t see buildings like that in China! At the border a guy offered to change money for me. He offered me a terrible rate but switched up to a reasonable one after a brief haggle. When he gave me my cash he passed me the wrong amount, I corrected him and he handed me the wrong amount again before I called him out for the second time and he finally gave him the correct amount of money! Why are money changers scam artists all around the world? 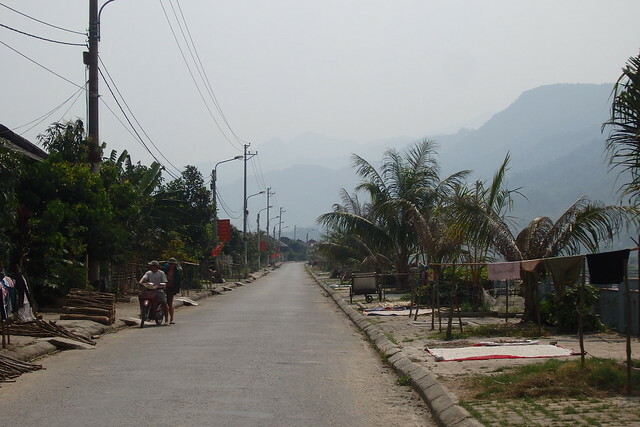 I stayed a couple of nights in the border town Lao Cai to get my bearings. The whole time I was in China I felt slightly lost but suddenly I realised how much I’d sussed out in my months over there. I knew enough Mandarin to get by, I knew what food was around and where to get it, I knew what the crack was with accommodation etc. Here everything was new to me. Many of the changes were subtle and hard to put a finger on but some were obvious from the first half hour I spent looking for a cheap room. The buildings were totally different colours and shapes, the language was written in Roman letters so I would actually identify words, everyone on a motorbike was wearing a helmet (no one bothered in China where they were optional but here it’s illegal to ride without) and – sorry China – the women were more beautiful. 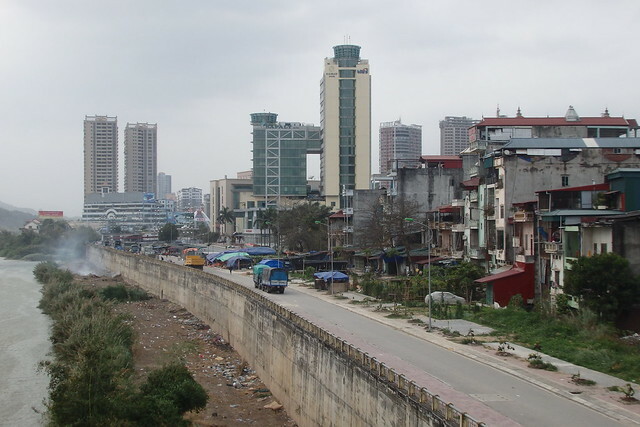 All those crumbly buildings in the foreground are in Vietnam. The sky scrapers in the background are across the river in China (surprise, surprise). The next morning I nipped down to the market and bought some bread for breakfast. I ate two plain baguettes and it was the most delicious thing ever. I’ve missed bread so much. I then headed for a cafe to satisfy another thing I’ve been missing badly – coffee. 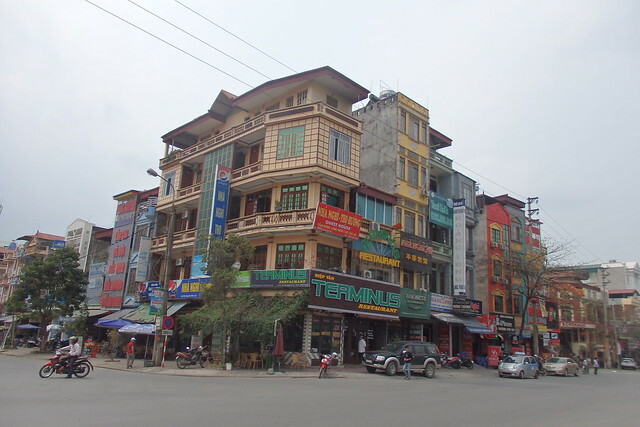 In Vietnam there are cafes everywhere. At the sides of the roads small plastic chairs are lined up to form makeshift bars. People just seem to be happy sitting around taking a long break at any time of the day. I love it. 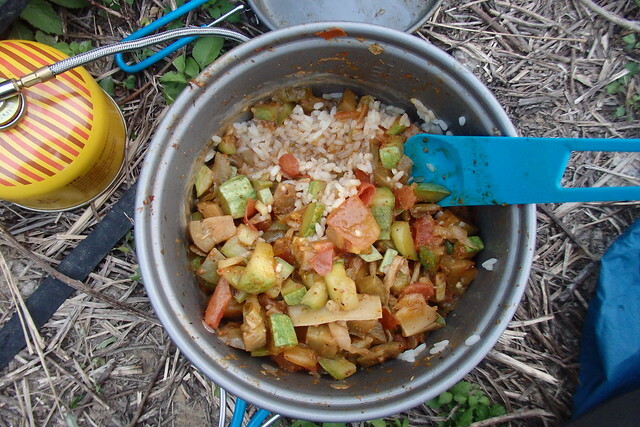 Kebab sandwich for lunch – no more noodle soup! Everything was so different in Vietnam. 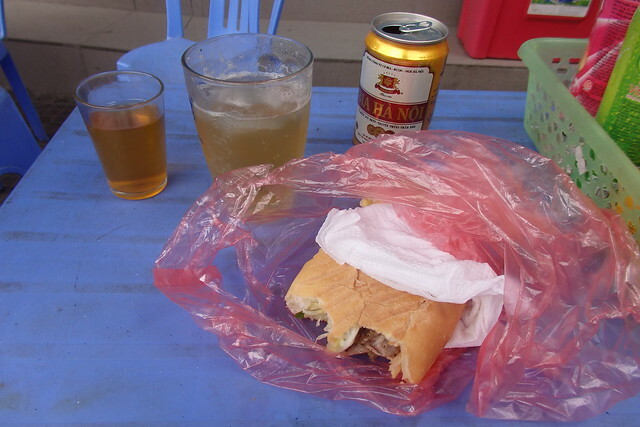 In the afternoon I sat at a roadside bar with a beer and a kebab sandwich. Would you see one of those in China? Not a chance. The beer came in a glass of ice. I’d forgotten the Vietnamese’s obsession with putting ice in beer but it was still better than the warm ones served across the border and even with the ice it was nowhere near as watery as the Chinese lagers. As I was tucking into my sandwich a nasty storm started to brew. 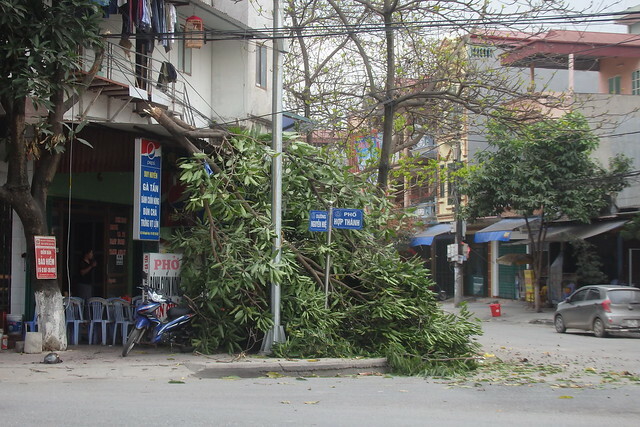 The wind snapped a huge tree across the road which collapsed and fell on the cafe across the road. 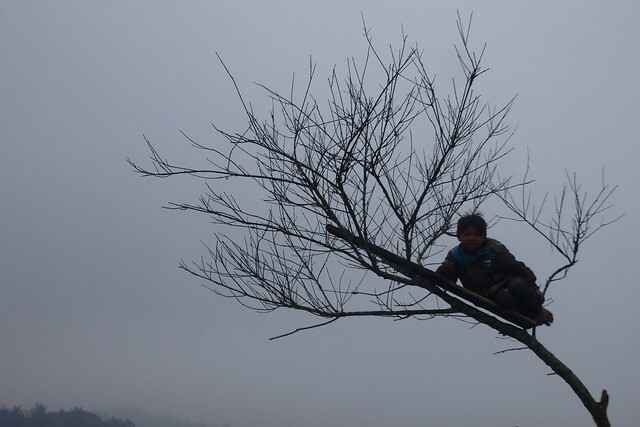 No one seemed fazed and the owner popped out with a machete to start cutting off the branches. 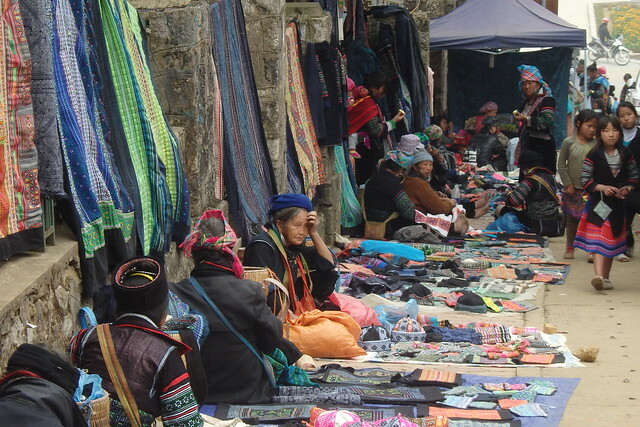 There was something incredibly charming about the busy chaos of Lao Cai. After months of meeting no one able to muster a word of English suddenly everyone seemed competent with the basics. 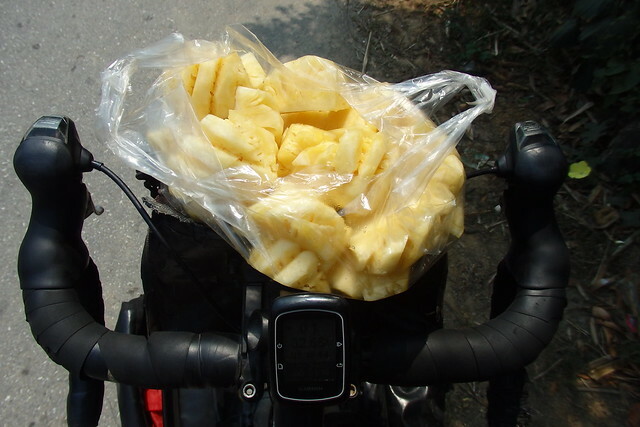 A taxi driver came over to me and asked in perfect English if I wanted a ride up to Sapa. ‘No thanks, I’m cycling up tomorrow’. ‘Bicycle? Impossible! Too far!’. I pulled up my shorts a little and tensed my thighs in response to his disbelief. His eyes bulged out as far as my muscle. ‘Wow, OK – maybe possible!’. 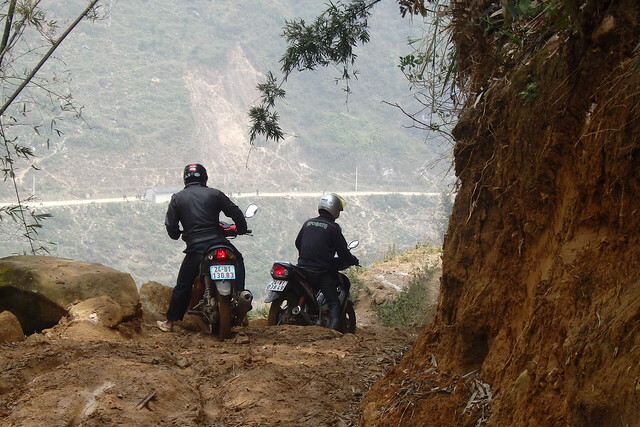 The ride up to Sapa was an exhausting uphill 30km. I spent the last couple hours deep in the cloud. Visibility was awful and the road was narrow. 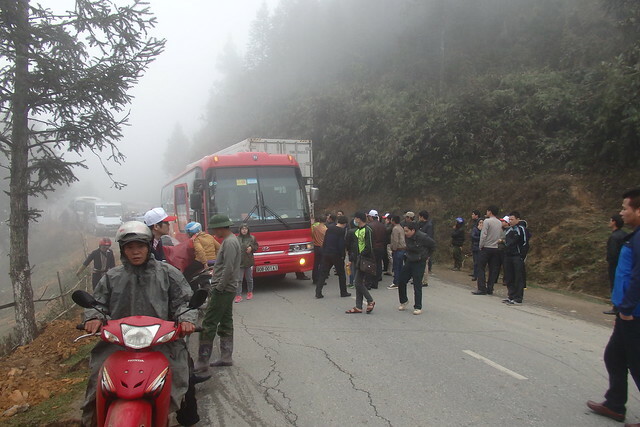 At one bend a bus and lorry had collided blocking off the road completely. I walked my bike past the traffic jam and enjoyed the last few kilometres of car-free cycling into town. I stayed in the first ‘proper’ hostel I’d been in for months. Clean beds, hot showers, working internet – the real deal. There were backpackers everywhere. It’s really hard to describe how strange a sight it was to be surrounded by foreigners after so many months of solitude. No one seemed particularly interested in who else was around. After I asked a few people what they were up to I realised why no-one asked the same question. Everyone was doing the same thing, more of less. 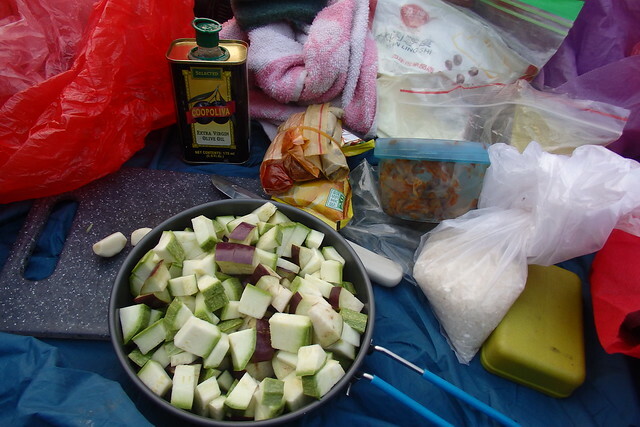 I was on the South-East Asia backpacker trail, well and truly. 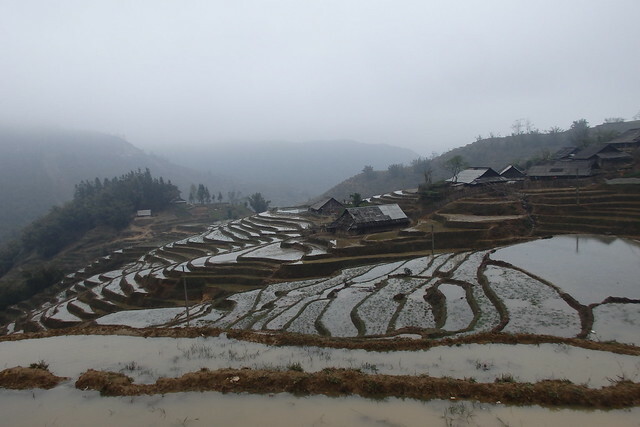 On my previous visit I’d gone for a hike around the surrounding rice terraces with a local guide called Shosho and some other tourists. I’d exchanged contact details with Shosho and got in back in touch. Unfortunately she was already on a hike the day I wanted to go walking, but I joined her sister (who I met last time) and a pair of German/Hungarian girls who were trekking with her. In the evening we stayed in the same homestay and I met Shosho again. I didn’t believe her when she said she remembered me, but her memory of our previous meeting turned out to be even better than my own. We found some of my old photos and had a laugh trying to decide who’s aged worse. I was glad I did the trip, but it reminded me why I don’t ever do these kind of tours now. They’re expensive, super touristy and the ‘trek’ was just a leisurely stroll for wimpy tourists. The area had changed massively over the last few years. 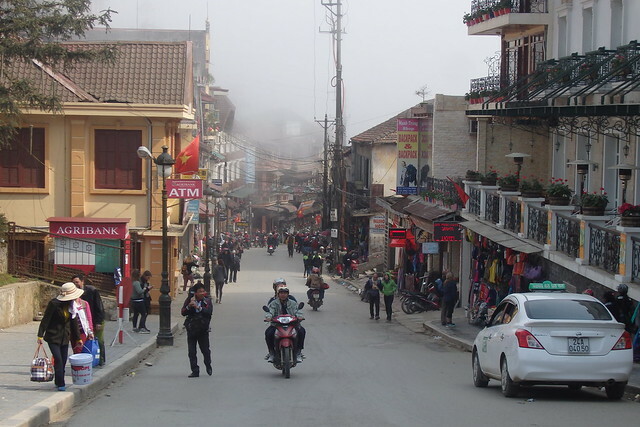 Not the town Sapa itself so much, but the surrounding villages were unrecognisable. 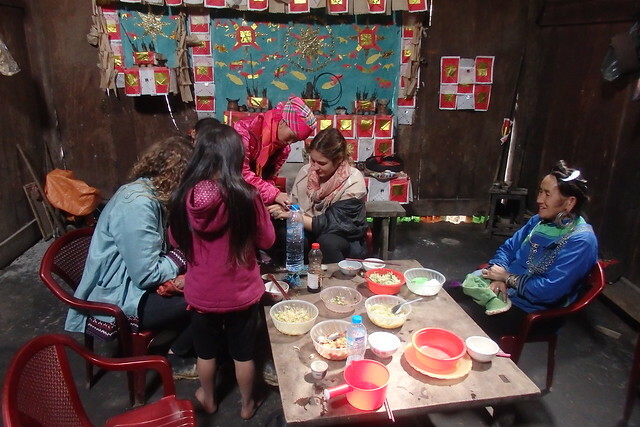 On my last visit I’d stayed in the same village and it had felt like a legit homestay. Now there were bars with fireplaces and pool tables and guesthouses all around the area. I had lunch in this exact room 5 years ago – the same granny is in one of my pictures from back then. It’s still a tourist trap tour, the local woman and daughter to the left had popped in to try and sell some jewellery to the girls I was walking with. Not a bad football pitch! 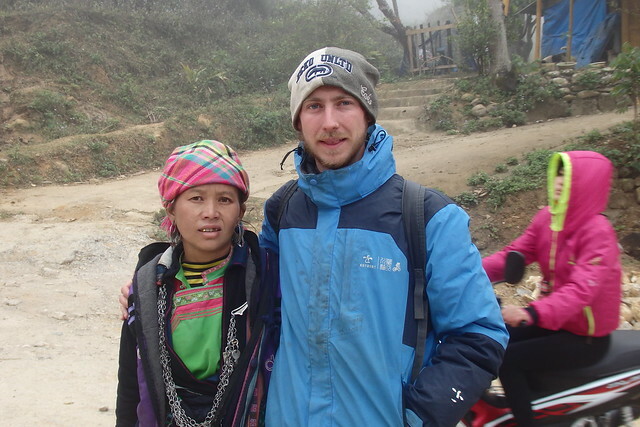 I hadn’t met another cyclist on a long tour for about 4 months. When I got back to the hostel another cyclist had turned up. Hubert was a polish bloke who’s been just a couple of weeks ahead of me in Central Asia. We’d met a few of the same people in the area and knew of others. 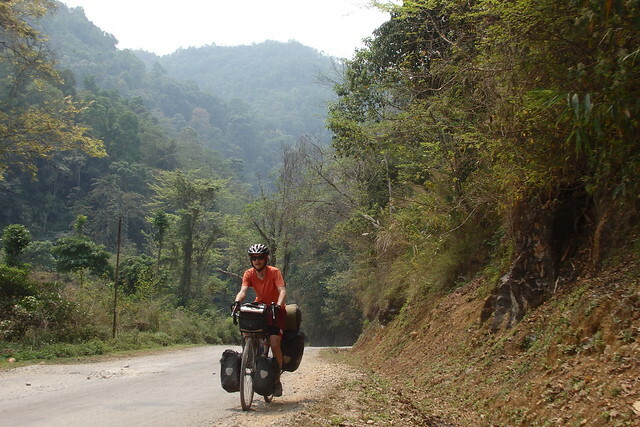 It was fun to meet another cyclist who’d been on a similar trip – we had much more to talk about than I had with the other backpackers. Where I’d headed into China he’d cycled up into Russia. We spent the evening comparing snow pictures. I think he won but you can decide yourself – here’s his blog. I’ve never seen a country with so many motorbikes. There’s nowhere they don’t seem to be able to get their bikes up! 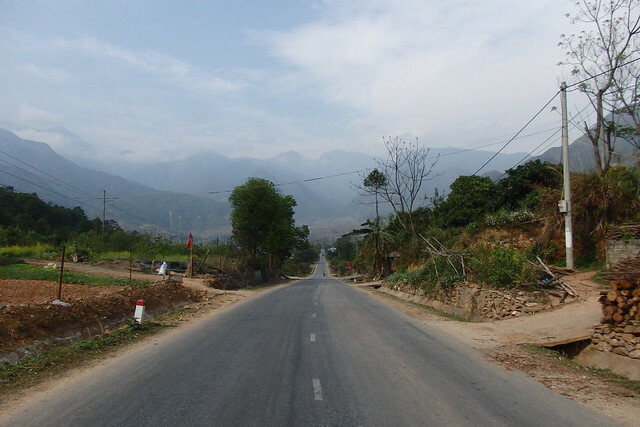 I followed the north-west loop road from Sapa. 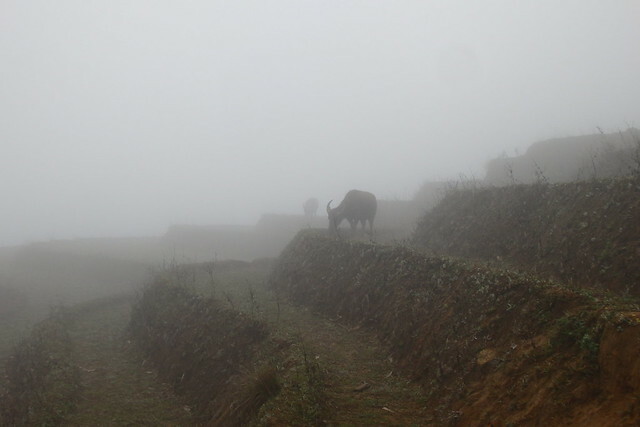 The weather was strange – cold clouds had been hanging over the surrounding mountains for days. I’d even had my down jacket back out in the evenings! 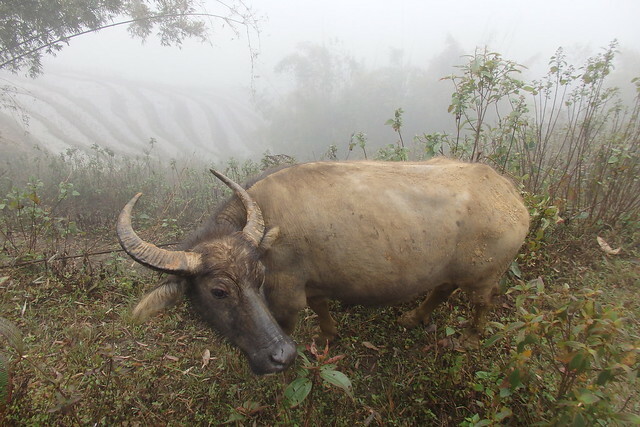 As I neared the mountain pass from Sapa I popped out above the clouds. 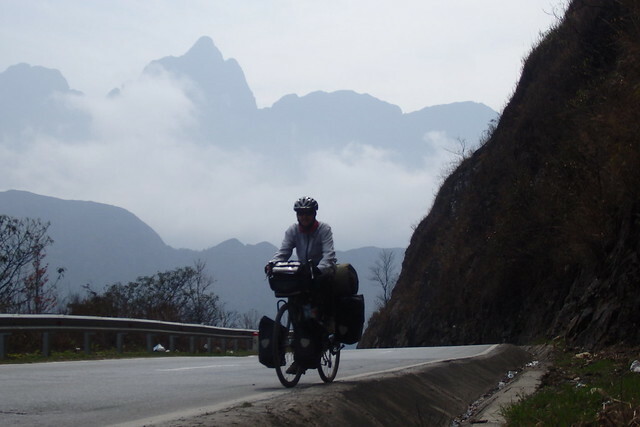 I don’t think of mountains when someone says Vietnam, but these were some big and beautiful peaks. 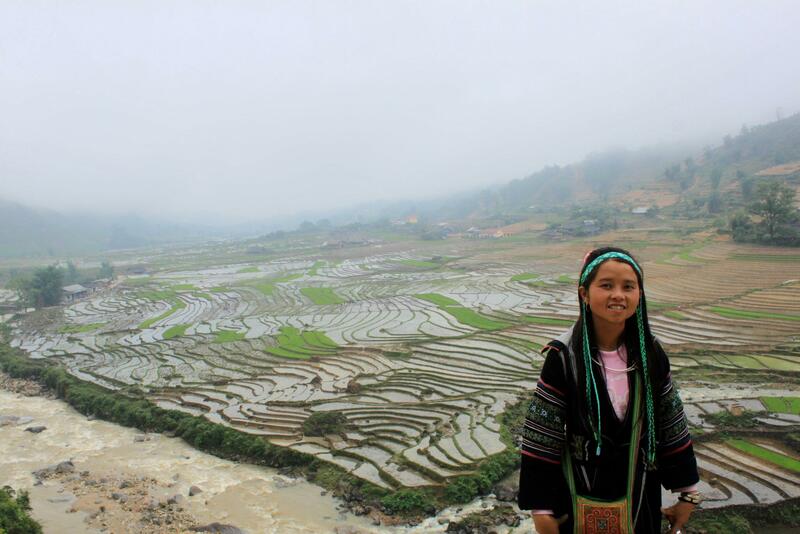 Shosho and the villagers around Sapa are Black Hmong people. 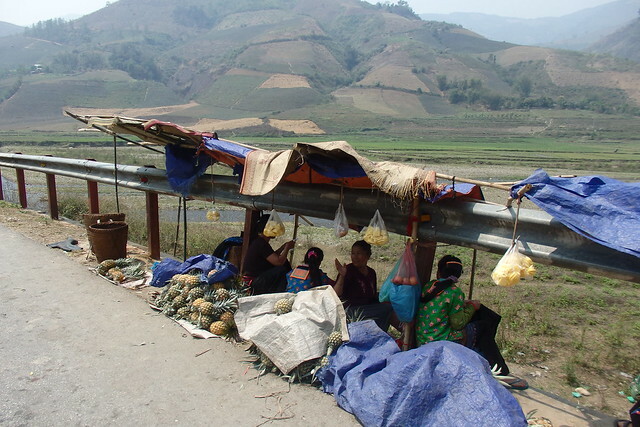 As I continued west the women’s clothes changed ever so slightly when I passed a Flower Hmong village. It was nice to see that people still wore their indigenous dress away from the touristy areas. The South East Asia adventure has started in style! 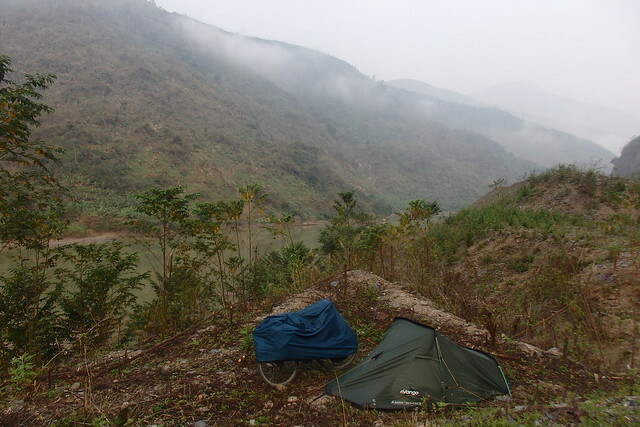 I camped the next three nights on my way to Laos. 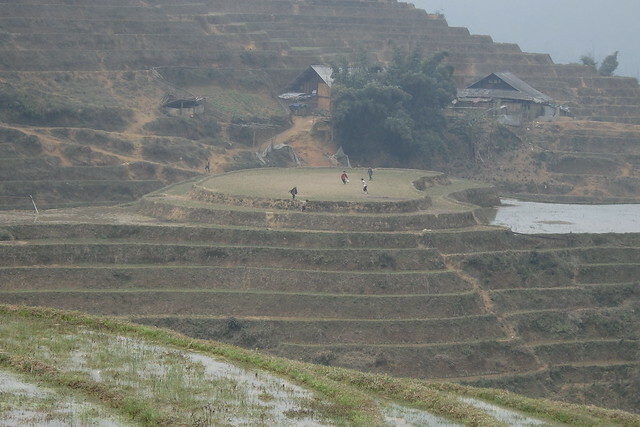 It was never easy to find a pitch, just like in China. 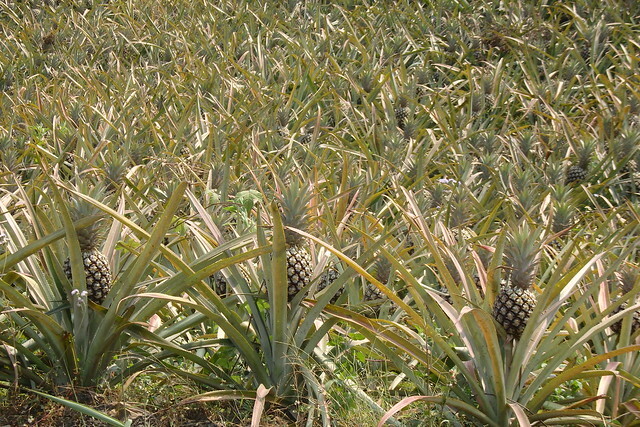 The difference here was that there were patches of un-farmed land around village homes. 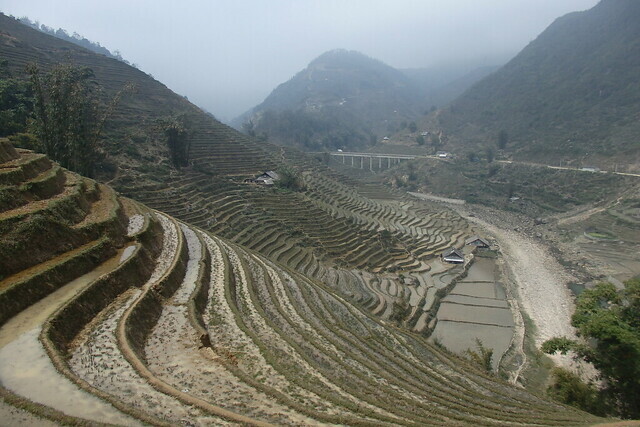 In China every slither of ground was always being farmed on, unless there was concrete on the floor. I could have asked to put my tent on someone’s land but I was asked by local kids for money the last three days and that put me off a little. I don’t mind being a pestered a little in the day time but I don’t want any bother when I’m trying to sleep. They didn’t ask in an aggressive manner. They were always smiling or laughing when they asked which made me think that they didn’t seriously expect anything, but I was still surprised by it – especially as I was in another ‘face’ conscious Asian country. No kids have asked me for money since I was Armenia 8 months ago. 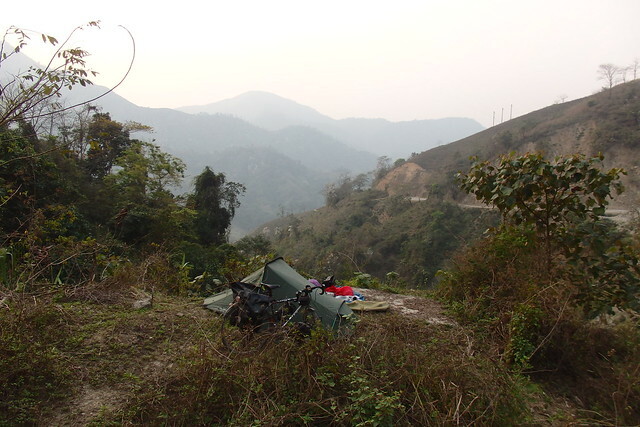 There people were poor, as they have been in many places I’ve cycled. 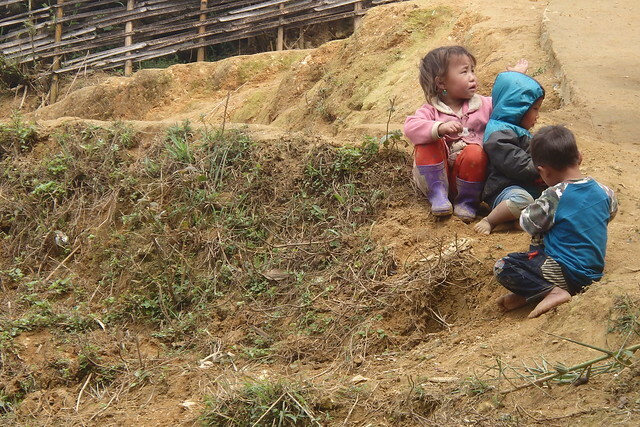 Here the people were not that poor (although I did pass a couple of villages nearer the Laos border were things did look very sorry). One of the kids was on a shiny motorbike. I didn’t feel bad telling him to piss off when he started rubbing his fingers at me. 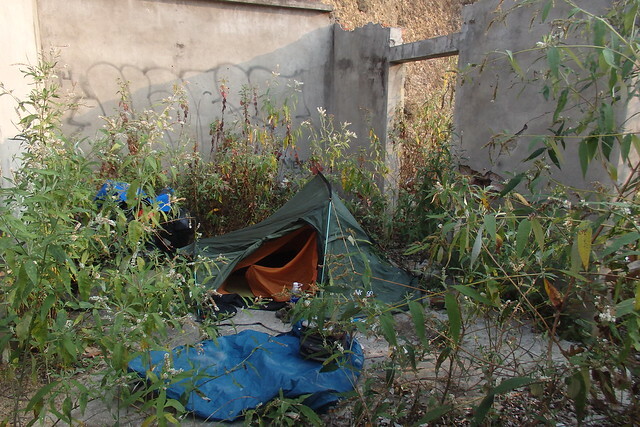 One night I settled for an abandoned building as my home for the night. It wasn’t the most scenic of spots, but I didn’t have much choice. On the way in I passed a couple of used needles on the floor but it seemed unlikely I’d have any visitors. I didn’t until the morning, when I heard a motorbike park outside the building. Two guys climbed in and walked into the room adjacent to my own. ‘Great’, I thought. Surely no one climbs into an abandoned building unless they’re up to something dodgy? I wasn’t scared, but I decided to sit totally silent and hope they wouldn’t realise I was in there. Unfortunately my tent was in clear sight from the corridor and one of the guys came walking into my ‘room’. I stood up to say hello in a confident manner but before I could do so the guy put a finger to his lips in a ‘be silent’ gesture. He looked me up and down before reaching out to shake my hand and then walked back to the other room. They spoke for a couple more minutes before I heard them leave and the motorbike rev off. God knows what that was all about. 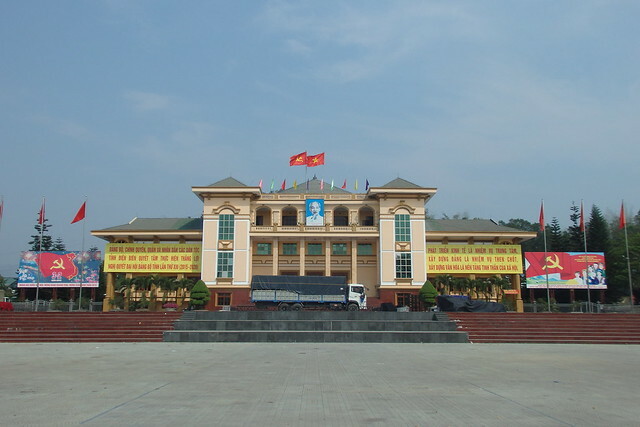 I stopped in Dien Bien Phu where I found a room for £3. There were at least a dozen of guest houses on top of each other by the bus station. I love places like that – there you can work a serious haggle with the comfort of knowing that there’s another empty room just next door. It wasn’t a particularly exciting town, but it’s one of historic importance. 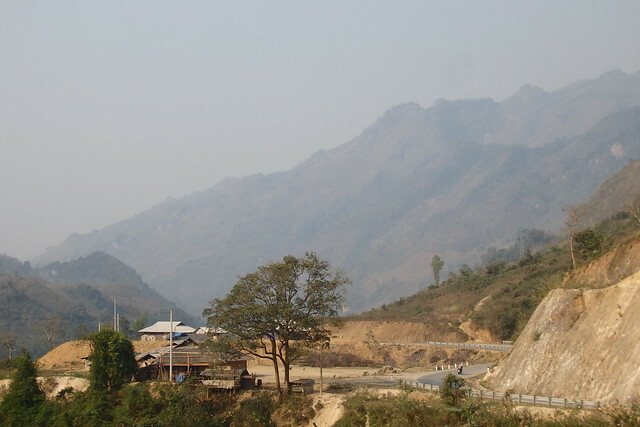 It was here that the French lost to the Viet Minh in the First Indochina War in 1954, effectively ending their colonial presence in South East Asia. I didn’t go to the war museum, but I did go for a stroll around the commemorative museum. 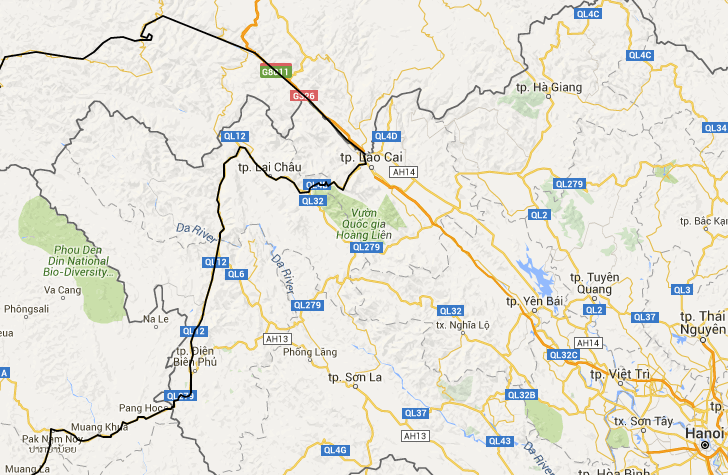 I just had one last day of cycling to the border. 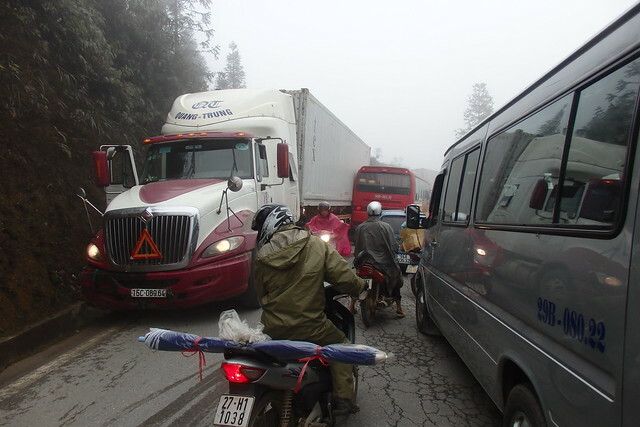 My chosen border crossing clearly wasn’t a popular one and I largely had the road to myself as I climbed towards the top. 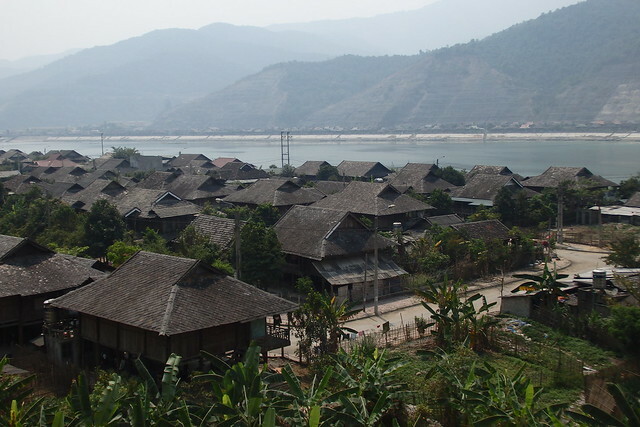 Vietnam had been a brief excursion, but I’d spent over a month here on my last visit and I wanted to spend more time in Laos. I hadn’t seen many foreigners the last few days, but nor had I really stopped anywhere there would be. 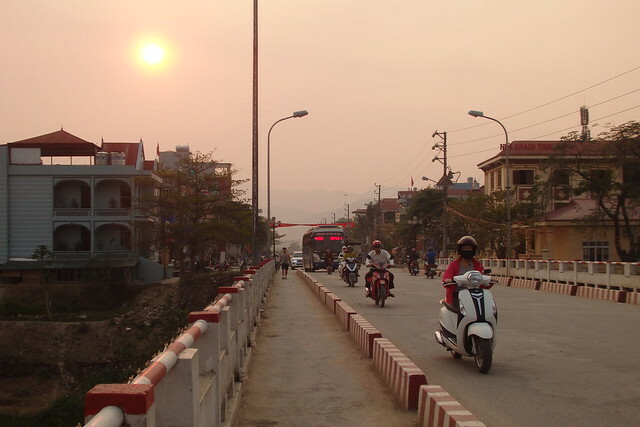 In Dien Bien Phuh there were a few tourists knocking around. I had dinner with a strange American bloke. At about 10pm he excused himself as he needed an ‘early night’ for his bus the next morning. He paid for 8 beers (he’d clearly been there a while before I arrived), then grabbed two bottles of vodka from the fridge, three bottles of soft drink and insisted on getting the waitress to bunch his outrageous pot-belly before leaving. There was no one at the border apart from a couple of very bored-looking guards. One of them offered to change some money for me at a very cheeky price. I told him to jog on and we haggled a reasonable rate. 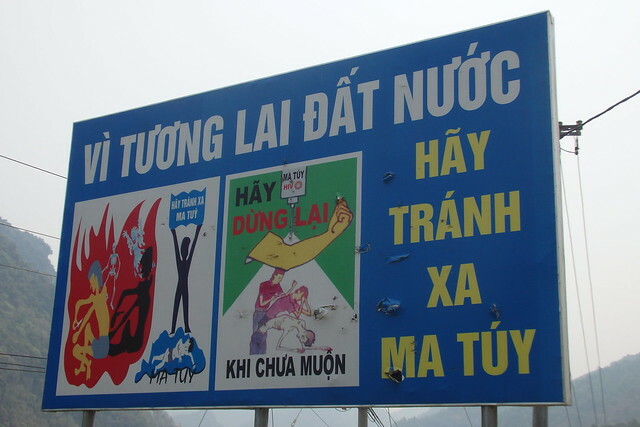 My exit from Vietnam was exactly the same as my arrival – trying not to get ripped off by money changers. In fact, I’ve spent most of my time in Vietnam trying not to get ripped off. I felt like people were trying it on with me at every opportunity and that left a slightly sour after-taste leaving the country. I felt like people were generally pretty honest in China. If people tried to get a little out of me at the markets there it was only a small amount, whereas in Vietnam they tried to pull some much more sneaky moves. Perhaps a difference was the fact that I didn’t know how to speak any Vietnamese to begin with but in China I was able to ask ‘how much is a kilo?’ most of the time. I doubt the Vietnamese thought what that trying to take advantage of a tourist was immoral, but preying on a foreigner just finding their feet in a new country seems like a pretty cut-throat way of making money. 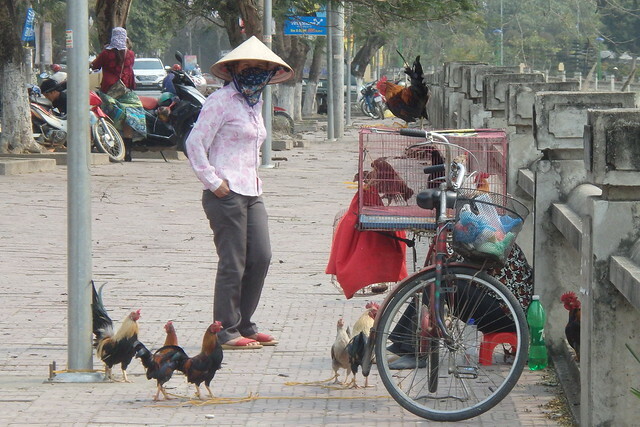 I popped into a market in Dien Bien Phuh on the last morning I was leaving. The woman asked for a silly amount of money for three tomatoes. I was trying to get rid of my change before leaving the country so I just smiled and said thanks. As I walked away she laughed and showed off to her mate at the stall next door waving the note in the air. I know you ripped me off. I don’t care about that. But if you’re going to show off about it at least wait for me to leave! Ah well, perhaps I just need to be a little more on my toes these days. Vietnam made me realise how much I’d ‘worked out’ in China. I arrived in South East Asia as a clueless traveller once again but I enjoy being just that. 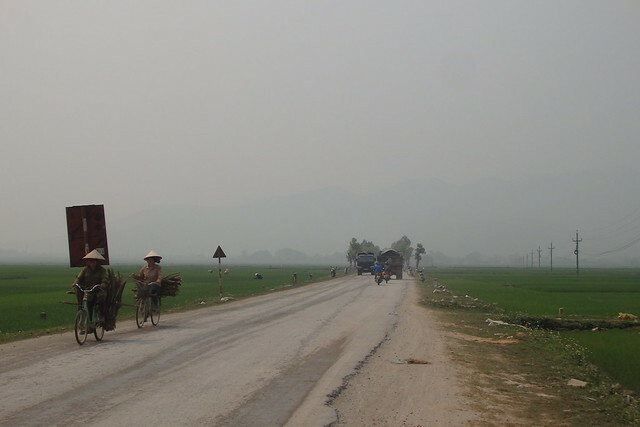 It’s a shame Vietnam was a brief encounter but I was excited about heading west. 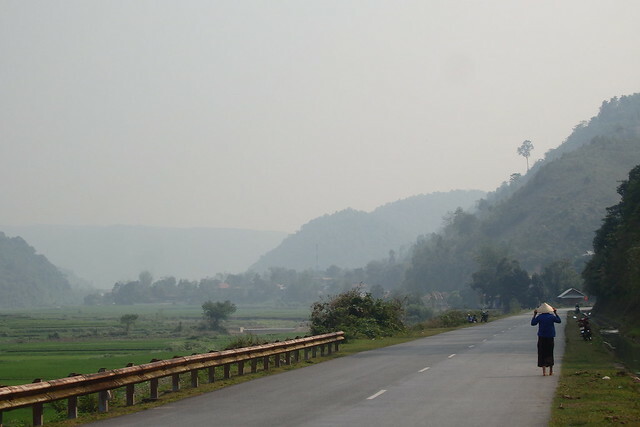 I saw a totally different side of the country to what I saw on my last visit here and that’s precisely what I wanted.